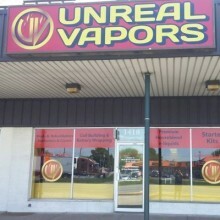 Unreal Vapors is a favorite place for vapors in the New Castle area, both beginners and experienced. With a wide range of products, including vaporizers, mods, RDAs, accessories and premium e-juice, we can recommend merchandise that fits your specific taste or need. Hope to meet you soon! Street Address: 1418 N Dupont Hwy.